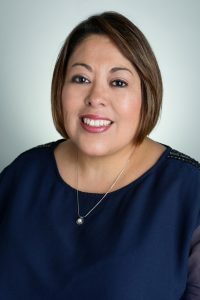 The Indiana University Latino Faculty and Staff Council will present its 2018 Latino Faculty and Staff Council Staff Award to Nelda Montemayor, Director of Graduate Admissions & Enrollment at the IU School of Public Health. The award will be presented April 20, 2018. Nelda is in her 10th year with Indiana University, currently serving as the Director of Graduate Admissions at IU’s School of Public Health. Nelda has also worked with special needs populations in non-for profit settings in the 14 years prior to joining IU. These settings included working with First Steps Early Intervention programs (in both Texas and Indiana), Head Start, and youth counseling programs. Advocacy for Autism and special needs is dear to her heart. Nelda is a 2018 board member of the Monroe County Autism Foundation. Nelda received her B.A. in Psychology/Concentration in Early childhood from Angelo State University in 1994. Currently, Nelda is pursuing her M.S. degree in Applied Health-Human Development and Family Studies at IU School of Public Health, anticipated graduation date is May of 2018. The award honors those who have demonstrated outstanding service to the university’s Latino community. The Latino Faculty and Staff Council represents the diverse Latino community at Indiana University. Its commitment is to build fellowship among Latinos and to address issues that face Latino faculty, staff, and students on the Bloomington campus.